Kids and parents both come and go with happy, smiling faces at Learning2Fly. ‘A Chakra Circus of Health’ summer camps are the perfect antidote for curious minds and energetic bodies. Parents love the educational aspect of the seven habits of health we teach kids. Kids love that they have fun while they’re learning. One thing for sure – there is never a dull moment in our 4-day camp. many campers come back week after week, summer after summer, because each week is different. It’s a joy for us to see returning students and families. Parents love ‘A Chakra Circus of Health’ camps because we reinforce these seven important and vital habits of health. A healthy body needs healthy food to thrive. But how many times can a child hear their parent tell them to eat their vegetables? So our teachers at Learning2Fly help reinforce those early nutrition habits so they’ll be set for life. Food is medicine after all. Movement is life, so we are committed to inspiring kids to develop a lifelong love of exercise. 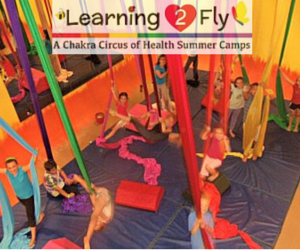 Kids will hula hoop, hike, climb aerial silks, practice yoga and other creative forms of movement. We want kids to have an expanded appreciation for their bodies and help them cultivate a lifelong love for taking care of it. Habit #3 – Learning & Self-Confidence. We all have to do our part to save the planet, so in this habit of health, kids will learn about our amazing ecosystem. We teach the concepts of reduce, reuse, recycle, and rethink what we are doing that affects the health of the seas, the air, and the forests. This land is yours and mine. We can work collectively to take care of it. Habit #5 – Family & Community. It is proven that the stronger our social ties, the stronger our immune systems. We need each other to thrive. We’ll talk about ways to get along with others, how to develop friendships, nurture relationships with families. Our relationships feed our spirit in many ways. Kids will also learn the positive impacts of volunteering in the community to make a difference helping others. Habit #6 – Global Awareness. Kids learn about other cultures around the world. We truly live in a global village, and seeing how others help us have a better quality of life helps us develop a sense of gratitude for all people and cultures. It’s a small, beautiful and diverse world after all. Spirituality can be practiced at any age. Children can also infuse their day with the principles of love and peace by being nice to kids at school, doing their chores without being asked, saying thank you, and using manners at the dinner table. These are fundamental ways kids can practice spirituality. Their spiritual muscles will get stronger everyday too. Each habit of health is taught in fun ways to kids. They don’t even realize they are learning because it’s so much fun! Parents appreciate we are reinforcing the things kids are learning at home. We are proud and grateful that ‘A Chakra Circus of Health’ summer camps are up and running for the 6th year. Thank you to all the local parents and kiddos for making that happen. We hope to meet you this summer. $200 for the week or $60 per day. Bring healthy lunch, snack, and water bottle. See complete details at www.iAmLearning2Fly.com Sign up early to reserve your spot.